Known Late Bronze Age settlement sites in the Middle East. During the Bronze Age the dominion over the small states in the region of Syria and Palestine was often contested by Egypt, Assyria and Hatti. Documents from the Syrian coastal city of Ugarit indicate a clear threat around 1190 BCE. The whole governmental system eventually collapsed in the wake of the Sea Peoples’ attacks and the subsequent turmoil. The region stretching south of the mountains of Anatolia towards the Euphrates and the Mediterranean Sea was called Syria in antiquity. Further south it extends into Palestine, forming the bridge between Egypt, the Jordan River and the Mediterranean. Due to its location, Syria served as a connection from Mesopotamia to the Mediterranean. The land itself was sought after for the durable cedars that grew on Mount Lebanon, which were required for shipbuilding and accordingly transported by water to Egypt and by land to Mesopotamia. 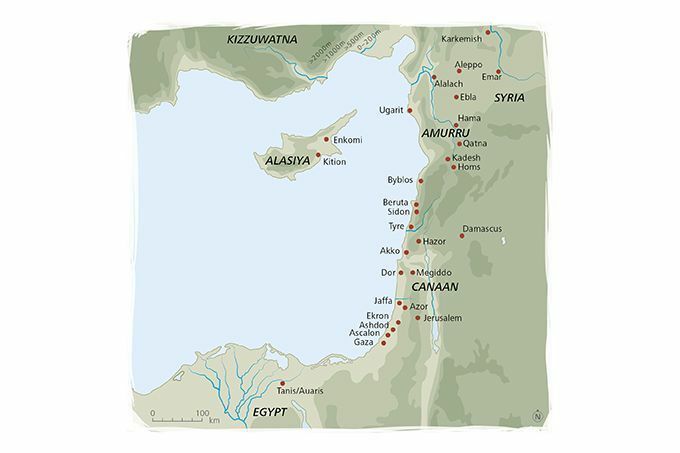 Evidence of trade contacts of the major commercial and cultural center Ugarit, located on the Syrian Mediterranean coast, shows connections to Egypt and further inland as well as to Cyprus and to the Aegean area. Palestine had a similar geostrategic importance as a bridge between Egypt and Arabia, Anatolia, Mesopotamia and Syria. From the 16th century BCE, Palestine was recognized as an Egyptian province. The ruling power, however, was left to local dynasties, of which there were several hundred. During the Late Bronze Age, the interests of the great powers Egypt, Assyria and Hatti collided in Syria and Palestine. Documents from Ugarit show that the city was at first a vassal of Egypt. From 1330 BCE, after several military campaigns by Suppiluliuma’s troops, however, Ugarit took the side of the Hittites. 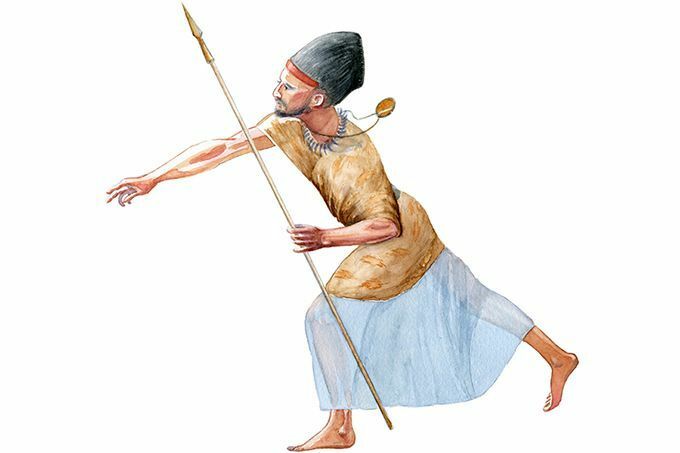 In 1274 BCE, conflicts between Hatti and Egypt triggered the Battle of Kadesh in Syria. The outcome was somewhat more favorable for the Hittite ruler, but Ramesses managed to consolidate his position on the coast of Palestine. In the wake of the Sea Peoples’ attacks and the subsequent turmoil around 1190 BCE, law and order seem to have been lost in Syria and Palestine. Documents mention the sighting of enemy ships. A call for help by the Ugaritic king remained unsent. The ruins of towns in the Syrian heartland and in the Euphrates valley cannot be directly attributed to invasions from the sea, but must be seen in relation to subsequent migrations and invasions as well as the collapse of the state. Neither the Hittite kings nor the Egyptian pharaohs were interested in having the small states in Syria/Palestine overcome their rivalry and fragmentation. The tense situation in the Middle East at that time served the great powers as a useful congregation of tax-paying vassals. Within the chain of events that ultimately led to the downfall of the Hittite Empire, a key role seems to have been played by Syria. Both the small states in the west and southwest of Asia Minor as well as the Kaška tribes in the north were considered to be notorious troublemakers. In Syria, around 1200 BCE, however, the Great King of Hatti had a loyal vassal. That the Sea Peoples specifically attacked Ugarit first might therefore be construed as an attempt to weaken the Hittite king. The influence of Mycenaean civilization in this region does not seem to have been very great. Ugarit received large quantities of Mycenaean pottery, but not a single Linear B document was found there. Also, among the approximately 2000 people mentioned in written sources from Ugarit, not a single Mycenaean name has been identified. The arrangement of historical material is intimately connected with the view and the judgment of the historian. No historical account is so enduring that it would not have to be tackled again and again. Professional historians develop peculiar preferences for self-limitations on excerpts of historical matters that are promising advantages at present.